Heyho... how's the effort to win my giveaway going? On this post, I'm going to show your how the gifts are doing. And this month, I'll also show you how to keep your book safe as much as possible! When you bring a book while travel, consider your book is also traveling. Which means when you pack things, you need good travel bag. And your book? It needs 'a bag' too. 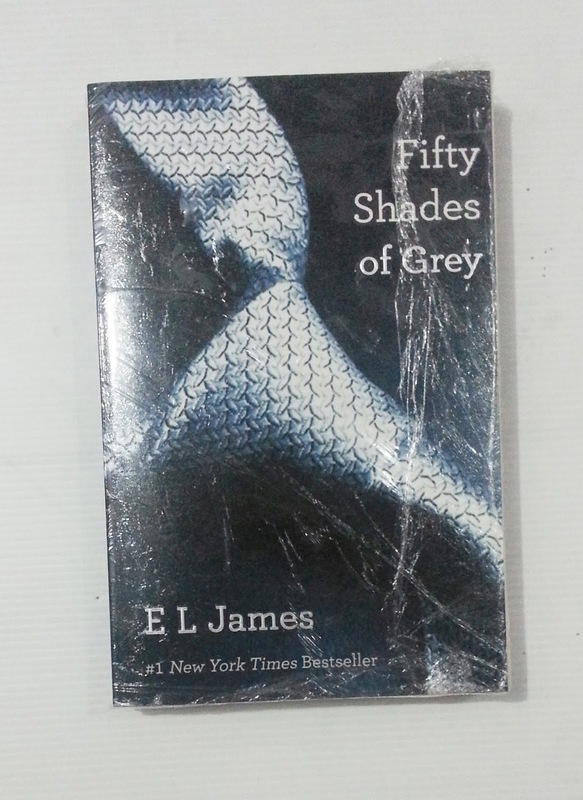 Let's say, it needs to be wrapped or put in a special pouch in order to keep the cover and pages at the side safe. Or else, you're thinking to give book as a gift? 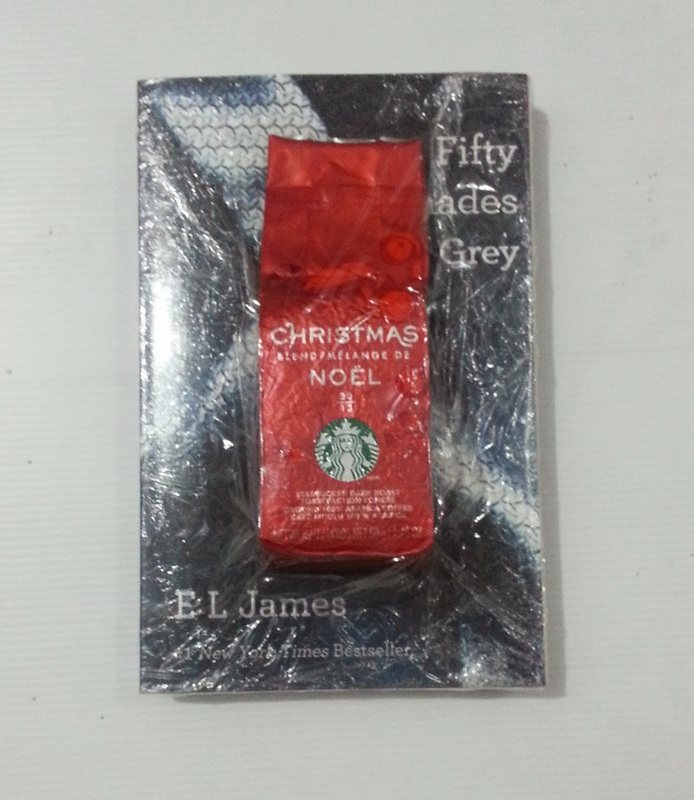 Before you wrap it with wrapping paper, make sure it's safe from any possibility to get spilled by any liquid. So, time to grab your stock of bubble wrap! WHAT? Oh dear... You run out of bubble wrap? Plastic kitchen wrap or cling film! Supposedly, it is used to wrap your left-over food in a bowl/plate. But this one can be your last resort. Cling film is soft, sticky and wrap your things nicely. It protects your book or anything wrapped in it from any dirt, liquid, etc...as long as you do it right. 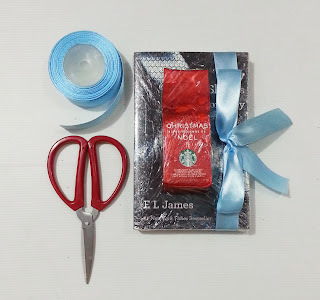 Whether you want your book to be wrapped again with attractive paper wrap, or put it inside your bag or envelope, wrap it closed with anything plastic first for it's waterproof benefits. It's very easy, but remember, the film is so thin that it might break apart so easily, too, when you try to cut it. The film is very fast in curling its edge and get untidy. Once again, I remind you that it's a little sticky (which is, I found, helping actually) although it has no glue by the way. 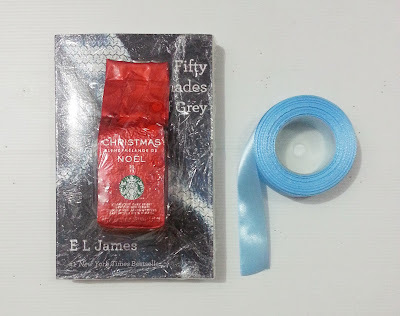 I will use it to wrap the giveaway gifts, which is Fifty Shades of Grey book and Starbucks Christmas Blend ground coffee. First the book! I notify you that the book has no wrapper when I bought it. Anyway, after I got it wrapped or not, I had to check every single pages and it has no missing pages or any problems inside. If it has, I need to exchange for a good one before a week after purchase. I don't want the receiver to be disappointed with bad printed book. Anything should be perfect. 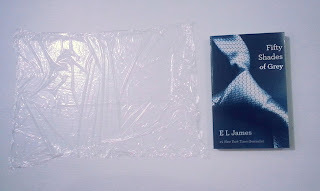 So, here's my cling film and the book. Don't forget to prepare the scissors, by the way. Be neat and wrap every side of the book. Compared to bubble wrap, cling film is lighter and thinner. Obviously. Less weight if you're planning to send it via mail service. But, that is so thin that it might not protect as strong as bubble wrap. But at least, it's waterproof and the pages at the side will be fine. The book shape will stay as it is. Don't forget the coffee! I cut a piece of layer of cling film to stick it with wrapped book so they stay together. It also means, double protection for the book. Anyway, you can wrap the book two or three times with multiple layers of cling film to make the wrapper a bit thicker so it protects stronger than single layer. Coz it's giveaway, the book and the coffee are considered as a gift package. I will make it look even nicer. How? I choose blue satin ribbon as it's in my stock. Ha! And the color is kinda match with the coffee packaging and the book. So, here you go! Are you interested to have these two wrapped up so pretty like that? You still have the chance! Join my giveaway here, follow the instructions and make entries as much as possible each day until Saturday, 4th January 2014.